Another good Yukon paved road with little traffic, the Klondike Highway (#2) is primarily used to reach Dawson City, some 550 kilometres north of Whitehorse. Forty kilometres before Dawson, the Dempster Highway branches north and extends past the Arctic Circle all the way to Inuvik, just shy of the Beaufort Sea in the Northwest Territories. This good gravel road also provides quick access to Tombstone Territorial Park, which offers excellent hiking and vibrant red and yellow fall colours, usually peaking in late August. Just north of Whitehorse, it’s well worth taking a short side trip off the Klondike to *Bean North Coffee Roasting and perhaps a dip in the nearby Takhini Hot Springs. Normally when I see large pump pots of coffee, I blanche, bracing myself for the inevitable disappointment of stale, weak or flavourless fluid. But when the server at Bean North puts out a fresh carafe of the Wilderness Wake Up blend and hands me a large mug warmed on the espresso machine tray, it’s a revelation. The coffee is strong and aromatic, and I can actually taste the advertised notes of chocolate, berry and nuts. On a subsequent visit, the double-shot Americano is even better, with just enough steamed water to let the complex flavours linger on my palate. 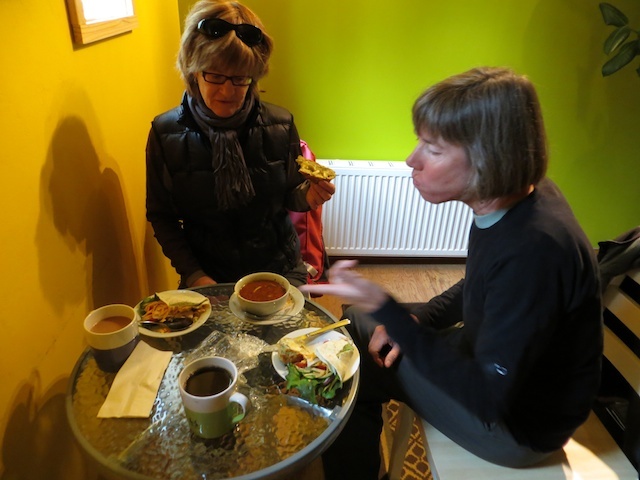 Bean North, one of Canada’s first fair-trade coffee roasters, also serves lunches, such as a fragrant carrot ginger soup with a warm biscuit or a cheesy panini, which can be enjoyed in the outdoor, flowery garden. But really, it’s the outstanding coffee that makes it worth the detour off the highway. Like Midnight Sun Coffee Roasters, Bean North coffee is offered at many Yukon establishments, but none seem to serve it as expertly as the home base. Like much of the Alaska Highway, the number of eateries along the Klondike Highway has dwindled in recent years to a handful of often dilapidated “lodges”, some no more than a gas bar and convenience store. There are only two worth stopping at, as long as you can avoid the four or so tour buses that disgorge their camera-toting loads each summer’s day. 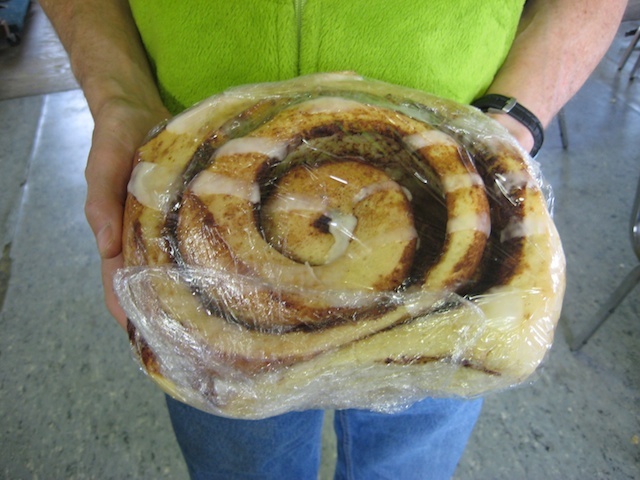 The first, some 90 kilometres up the highway, is Braeburn Lodge, famous for its cinnamon buns and curt, silver-bearded owner. I did a double take when the latter said the former cost $9.50, till I saw the much-lauded size, enough to feed a sweet-toothed family of four. They were actually pretty tasty, especially if you could get them fresh from the oven and not wrapped in plastic. Considering they bake and sell up to 100 of these “loaves” a day, they’re all pretty fresh, though contributing to North Americans’ growing waistlines. To keep pace with the monster buns, Braeburn also serves mammoth sandwiches and some decent soups. The furnishings, if you eat in, are pretty bleak, but it all adds up to a Yukon character experience. It’s another 280 km north to Moose Creek Lodge, giving you perhaps enough digesting time to work up a fresh appetite. Most folks, however, stop just for treats like fresh-baked rhubarb tarts or sausage rolls, though you can order standard breakfasts, hamburgers and the like. But I’d advise steering clear of the coffee, unless you need to stay awake for the homestretch drive into Dawson. 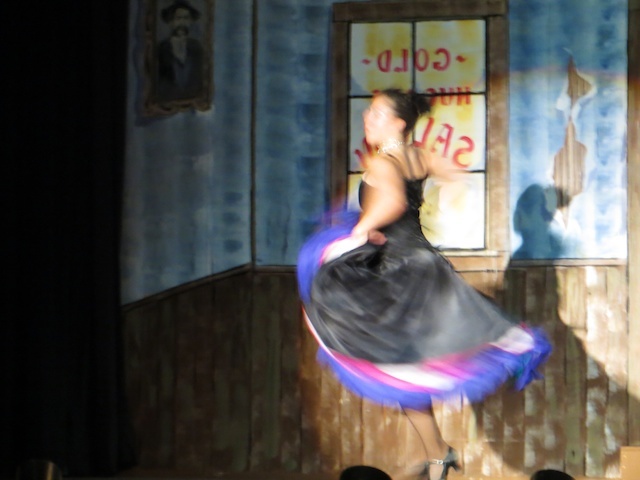 Situated at the junctions of the Yukon and Klondike Rivers and the famous Bonanza Creek, Dawson City heartily celebrates the gold rush of the 1890s and beyond. The false-front buildings, the mud-packed side streets with their boardwalks and the entry into town past sinuous piles of gold tailings gravel (some now turned into subdivisions with names like Dredge Pond) all lend a rough authenticity to a community of 1,300, which swells to many times that size during the brief summer tourist season. Parks Canada offers a number of excellent, reasonably priced programs that interpret this rich gold-rush history, though unfortunate budget cuts have closed its tours of the impressive, restored Dredge No. 4. 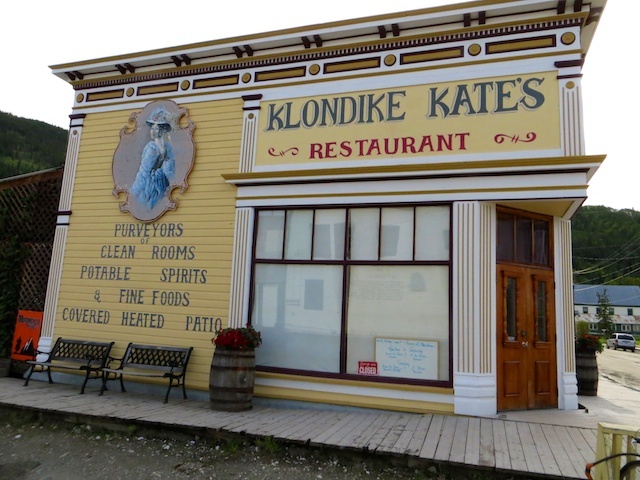 The best of a surprising number of good places to eat for lunch and certainly dinner in Dawson City is *Klondike Kate’s, located in a 1904 building. At 64 degrees latitude, with 90 frost-free days and permafrost lurking not far below the surface, Dawson is an unlikely place for a restaurant to be participating in the local food movement, other than perhaps the odd caribou stew. Yet Kate’s takes advantage of the surprising gardening season under the midnight sun to buy locally-grown lettuce and cauliflowers for its dishes and to forage for wild mushrooms, berries and spruce tips, the latter to add zip to the sauce on its Ibex Valley (outside Whitehorse) burger. Indeed, I spotted a sign in the window that said “We’re buying fresh morels.” Perhaps the most riveting sight on the dinner table was not the smoked chicken leg, the Alsek River salmon, the beer-poached elk sausage or the pulled pork salad. 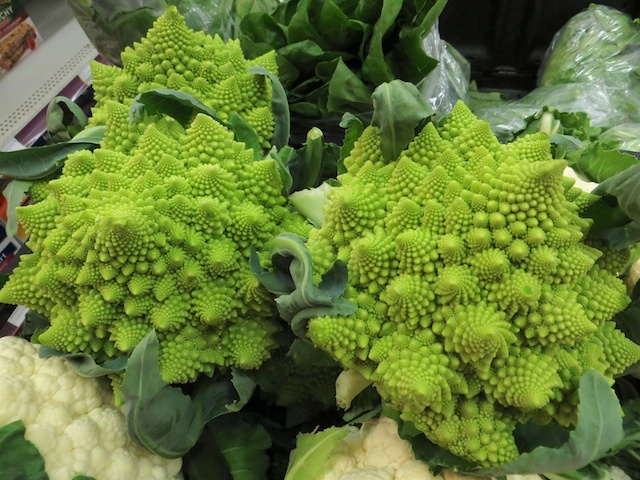 Instead, it was a side dish of brilliant green romanesco, a fractal-shaped cross between a cauliflower and broccoli, grown on an island in the nearby Yukon River. The lunchtime menu features fine soups, burgers, quesadillas and house-made, grilled cornbread. Would you believe this romanesco veggie grows at 64 degrees latitude? Over on Front Street, Sourdough Joe’s packs in the tourists, who mainly devour fish and chips (halibut, cod or a very nice salmon). A good before- or after-dinner stop is Bombay Peggy’s (“The Yukon’s only restored brothel,” at 2 Avenue and Princess Street), where you can quaff an ale or order a lewdly-named martini such as Bloomer Remover or 50 Below Job. Hey, it’s the Yukon. Speaking of improprieties, no visit to Dawson would be complete without a spirited, professional dancehall show at Diamond Tooth Gerties Gambling Hall (4th and Queen Street). You can even order a decent slice of pizza to go with your drink of choice. But if you really want to sample the underbelly of Dawson where few tourists would think of venturing, sidle up to the bar at the aptly named Snake Pit in the Westminster Hotel (975 3 Avenue). The most popular sit-down spot for breakfast is Riverwest Bistro (958 Front Street), where you’ll find a steady stream of customers ordering breakfast sandwiches, omelets, huevos rancheros and lots of Midnight Sun coffee. But I like heading down a few doors, with locals mostly, to *Cheechakos Bake Shop (905 Front Street), a takeout spot with a few stools. They make fine muffins and sweet and savoury scones, pizza slices and hot loaves of sourdough bread. What’s most impressive is that each morning, they roast a large, house-marinated ham, turkey and roast of beef and carve them up to be stacked inside their English muffins for the breakfast and lunch sandwiches. But you’d best hurry. Most of the baked goods are long gone by early afternoon. Forty-five minutes south of Whitehorse, Carcross is scenically situated at the north end of Bennett Lake. 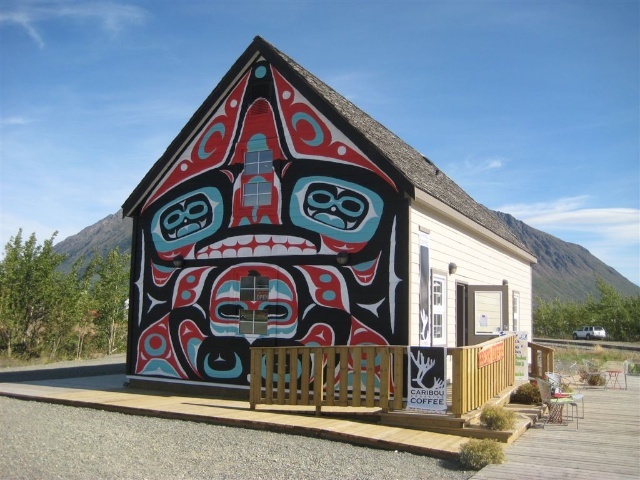 Make sure to stop at Caribou Crossing Coffee, situated in a building with a large Tlingit mural and a brightly lit interior with local art on the walls. It serves good Bean North coffee as well as sandwiches and baked treats. 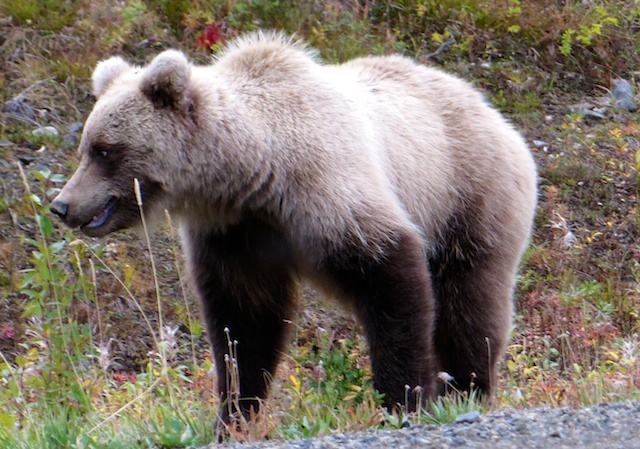 This entry was posted in Tombstone Territorial Park, Whitehorse, Yukon Territory and tagged Dawson City, grizzly bears, Tombstone Territorial Park, Yukon Territory on August 30, 2013 by bcorbett907. Second picture Bill – are these my friends MargS and JeanW? When was this trip? Recent? Looks like a great road trip north! Ah brings back memories of our great trip to the far north this past summer! 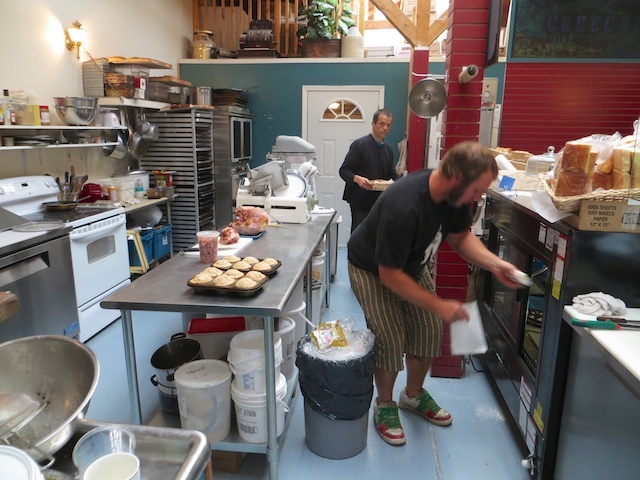 But you missed the bakery in Haines Junction! What a treat that was!